Sport leagues and tournaments for the entire McMaster community, beginner to advanced, individual or team: We want to play with you! When are leagues and tournaments in this sport offered? What PlayStyles are available? Check the Sport Calendar on the 'SPORTS' tab of our Intramural Sports page. 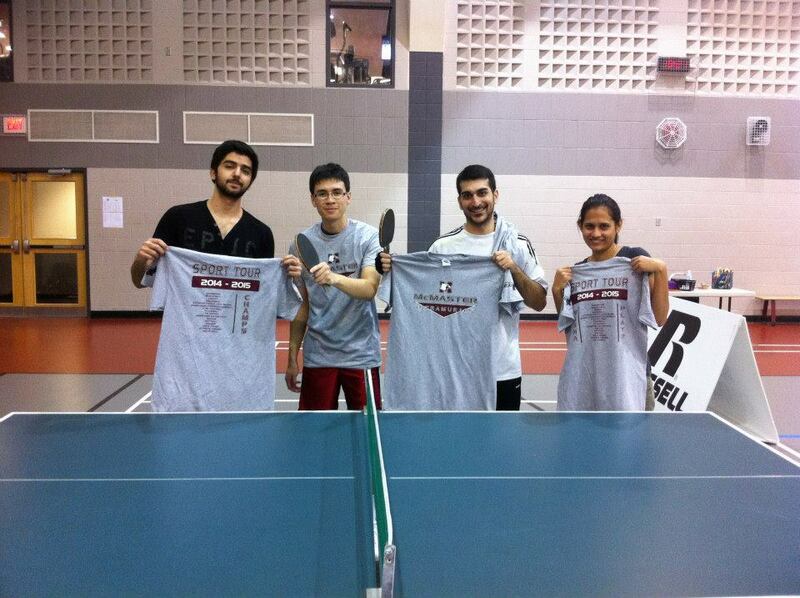 Who can play Intramural Sports at McMaster? How do I register? Check the 'REGISTER' tab of our Intramural Sports page. Singles will have one player per team. Doubles will have two players per team. Team Format will require a maximum number of 3 players per team. There are no minimum requirements to play, if a team does not meet the roster requirements they cannot play their scheduled game. Each match will consist of a best of 3 games, with a 27 minute time limit for each match. Each game will be up to 11 points, with a “win by 2” rule. a) In doubles, the server shall first make a good service, the receiver shall then make a good return, the partner of the server shall then make a good return, the partner of the receiver shall then make a good return and thereafter each player in turn in that sequence shall make a good return. b) The winner of the coin toss will either decide the service order or start at a particular end. The loser shall have the other choice. c) After 2 points have been scored, the receiving side shall become the serving side and so on until the end of the game, unless both sides score 10 points – the sequences of serving and receiving shall be the same but each side shall serve for only 1 point in turn. d) In doubles, at each change of service the previous receiver shall become the server and the partner of the previous server shall become the receiver. e) The side starting at one end in a game shall start at the other end in the next game of the match and in the last possible game of a match the sides shall change ends when one side scores 5 points.